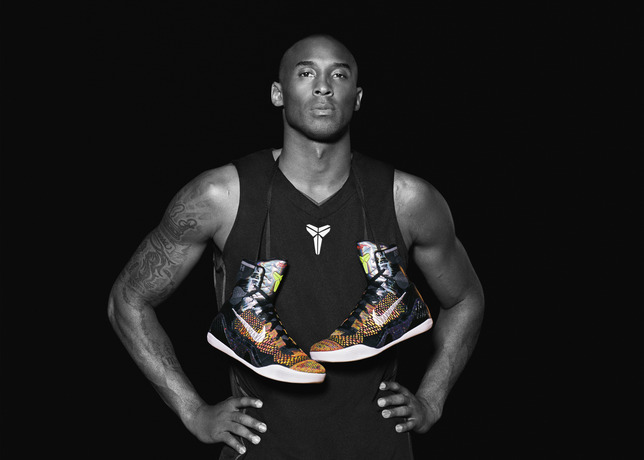 Volume 9 of the Nike Kobe series has officially been unveiled. 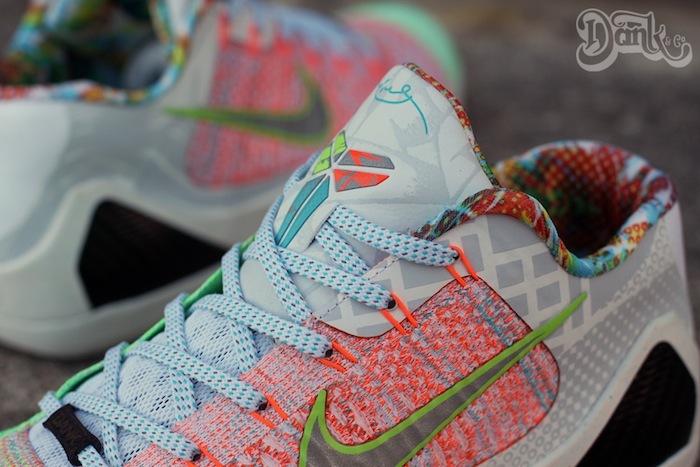 The first colorway of the Nike Kobe 8 will release in the Elite version on February 8th. Below is an official Press Release released by Nike. 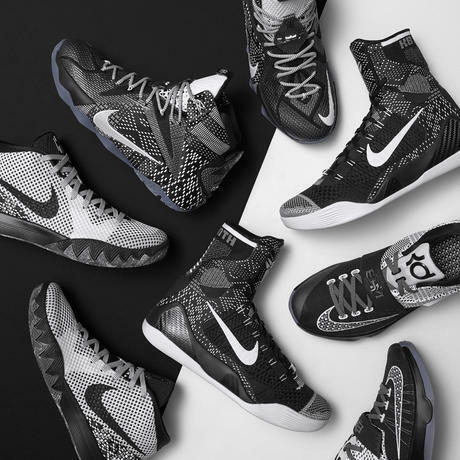 Nike, the world’s leading basketball brand, today unveiled the much-anticipated KOBE 9 Elite shoe at an event held at The Museum of Contemporary Art (MOCA) in Los Angeles. 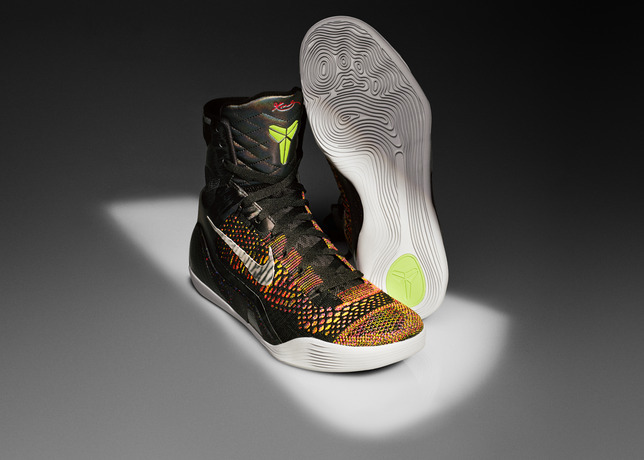 The KOBE 9 Elite redefines the aesthetics and performance of a basketball shoe and was designed using Nike Flyknit according to Nike’s “Nature Amplified” design ethos, an approach focused on designing for the body in motion and fueled by scientific data and athlete insights. Designed with Kobe’s tech insights and design inspirations, the KOBE 9 Elite features three key technologies: Nike Flyknit, Flywire and Lunarlon, giving the shoe superior lightweight performance. The innovative design enhances the foot’s natural movements while providing Kobe with strength, durability and speed, plus all the benefits of natural motion where he needs it most. Nike Flyknit – which was first used in Nike Running shoes in 2012 – defies conventional shoe manufacturing processes by creating a one-piece engineered upper made from single strands of yarns. Lightweight yet incredibly strong, it has redefined sports shoe technology and comes to basketball for the first time in the KOBE 9 Elite. Reverting back to a higher cut for the first time since his third signature shoe in 2007, Kobe’s ninth signature shoe features a knit collar for the proprioceptive feel of a low-top with the support of a mid-top. With the lead colorway dubbed ‘Masterpiece,’ the KOBE 9 Elite uses the intriguing visual patterns allowed by Nike Flyknit to create a piece of art on the upper, nine red embroidered details on the heel give a nod to Kobe’s Achilles sutures. The design on the outsole is based on the pressure mapping of Kobe’s own foot, creating a beautiful pattern while providing traction on court. 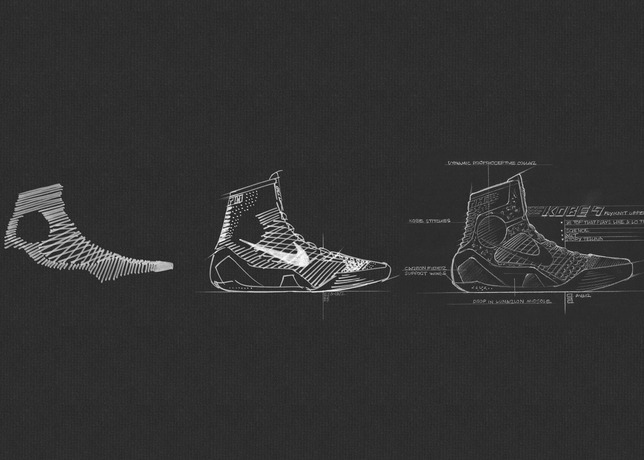 Nike Flyknit and Flywire technologies are a one-two punch, leading to a dynamic fit for Kobe’s intricate footwork. The single layer Nike Flyknit creates a seamless engineered upper that is the ultimate in superior lightweight performance integrating areas of high breathability, stretch and support where it’s needed most. The carbon fiber heel counter provides strong and lightweight lateral stability when moving from side to side, while the heel remains stable. Eliminating bulk and distraction was a focus for Avar. 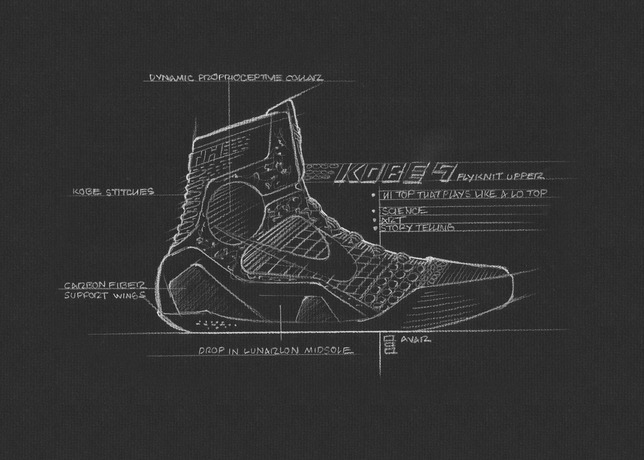 The idea of ‘simplifying without compromise’ helped shape the design of the KOBE 9 Elite. Nike Lunarlon cushioning insert provides responsive cushioning that keeps the foot connected to the court. The pressure mapping designed, minimal rubber outsole delivers durable traction and mimics the natural contours of the foot. Nike Flyknit technology introduces a new way to construct a shoe upper by knitting strands of yarn. Nike Flyknit is better for the planet because it drastically reduces waste and materials from typical upper construction. The KOBE 9 Elite upper reduces waste by nearly 50% compared to traditional high-top basketball shoes that use multiple segments and cuts of material in the construction process. 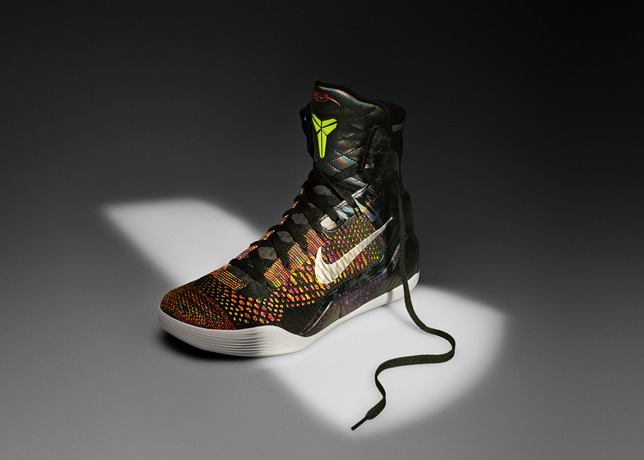 The KOBE 9 Elite releases globally on Feb. 8, 2014, at Nike.com and select global retail locations. 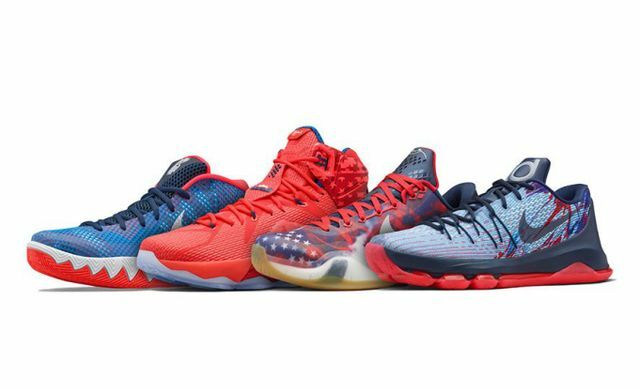 cant wait for the mid….this is a little too high for me personally! !